It is National ADHD Month — the perfect time to review the facts on this frequently talked about but commonly misunderstood disorder. What is it like to live with ADHD, what are the symptoms, and how can it be managed? Everyone has heard about ADHD, and most "know" that it has something to do with annoying, hyperactive kids. But what is Attention Deficit Hyperactivity Disorder really? What symptoms does someone have to have to "qualify" for an ADHD diagnosis? How is ADHD treated — to be more precise, do people with ADHD need drugs to fit in? It's September, the month in which the school year starts in most places, and a fitting time to bring attention to ADHD through National Attention Deficit Hyperactivity Disorder Month. Here at SteadyHealth, we want you to know all about this commonly misunderstood disorder. Read More: Does Easy Distraction Mean ADHD? Chana, now a middle-aged professional woman, always felt different — she was easily distracted, started projects with enthusiasm but seemingly never managed to finish them, and literally had to move all the time. "At least one leg had to be moving," she says. "The external had to match was was going on in my head: too much at the same time." Though Chana finished college, she always felt like an underachiever and her constant hyperactivity made sure she had a hard time at school and at home. She figured out she had ADHD after a friend pointed her to an online self-diagnosis test 10 years ago. After the test, she sought medical help and now manages her ADHD with the help of a fish oil formulation. "I can finally concentrate, and the leg movements have stopped too." So, did she ever consider Ritalin? "No, because I read that it interferes with creativity." ADHD has many faces, and Chana certainly isn't the hyperactive, aggressive elementary-aged kid that most people expect to hear about when they hear "Attention Deficit Hyperactivity Disorder". Sam's son matches that picture more closely. "Our boy was born prematurely," he says. "It became clear that he was different pretty early on. When we enrolled him in preschool at age four, the teacher complained immediately. Our son would not listen to anyone, could not stay seated even for short periods of time, and was aggressive. He'd hit instead of trying to talk." At the school's insistence, Sam and his wife (who are from Europe) sought help from a psychiatrist. He was diagnosed with ADHD, but was also found to be on the autism spectrum. Disorders such as autism can go hand in hand with an ADHD diagnosis, but only of the ADHD symptoms do not occur solely within the context of the other disorder. Sam's boy is now 14 and on Ritalin, attending a special school, and doing much better. "But," Sam says, "you can really tell when his medication wears off in the evenings, and I honestly dread the time they're gonna want to wean him off it completely or he refuses to take it." 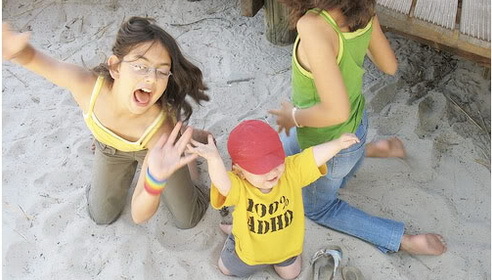 ADHD is the most common childhood psychiatric disorder. Its main characteristics are inattention, hyperactivity, and impulsivity. Doesn't that sound like any kid you know? Parents magazine and the Child Mind Institute surveyed Parents readers and found that 62 percent of the participating parents thought that ADHD was overdiagnosed. As much as 72 percent believed that doctors were too quick to put children on medication. Some people even believe that ADHD isn't a real disorder at all, but simply normal childhood behavior. It may be true that today's doctors are too eager to diagnose ADHD and place a child on medication simply to make him or her easier to deal with. While this would certainly mean we have a problem that needs to be addressed, it is important to acknowledge that Attention Deficit Hyperactivity Disorder is a real disorder with symptoms quite different from normal childhood behaviors. Concentration problems, hyperactivity and impulsivity may be common to all children (and adults, for that matter), but the degree and context is quite different in ADHD patients. The symptoms occur in different situations, so not just at school, just at home, or just at work. The cause of the symptoms lies within the person, not the context. The symptoms are manifested before age 12. They don't suddenly appear with age, though they can decrease over time with maturity. According to the American Psychiatric Association, between three and seven percent of school-aged children has ADHD. Boys are more likely to have ADHD than girls. Research shows that 40 to 50 percent of ADHD sufferers has the disorder in combination with aggression, while around a quarter suffers from fears. Only a quarter has "pure" ADHD — but even that comes in three different types, which you can read more about on the next page. The exact cause of ADHD remains unknown, but research has shown that the brains of people with the disorder function differently and the frontal lobe, basal ganglia, caudate nucleus, cerebellum, and other parts of the brain play a role. There is a hereditary component to ADHD as well, and environmental factors such as complications during pregnancy or birth, dysfunctional family relationships, and later on accidents or meningitis are also linked to ADHD.